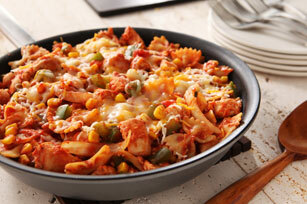 Chunky salsa and a blend of Mexican-style cheeses gives this easy chicken and pasta skillet a taste of Mexico. Cook and stir chicken in large skillet sprayed with cooking spray on medium heat 5 min. Add vegetables; cook 5 min. or until chicken is done and vegetables are crisp-tender, stirring occasionally. Add tomato sauce, salsa and pasta; cook 5 min. or until heated through, stirring occasionally. Stir in 1/2 cup cheese; top with remaining cheese. Remove from heat; cover. Let stand 2 min. or until cheese is melted. Like it spicy? Add 1/4 tsp. chili powder to cooked chicken mixture in skillet along with the tomato sauce, salsa and pasta.